Financial services providers like banks and insurers are lagging behind in digital transformation compared to other industry sectors. Financial services providers report falling confidence in their digital capabilities, and a shortage of the skills, leadership and collective vision needed to shape the digital future, reveals a report. The Global Digital Mastery Series report from Capgemini says that while banking transformation has taken centre stage, insurance players are more focussed on automation. Although banks' digital transformation journeys are well underway, the industry has reached a crossroads, cites the report, as it attempts to meet the rising digital expectations of customers, manage cost pressures, and compete with technology upstarts. Fewer than half of banks (38%) say they have the necessary digital and leadership capabilities required for transformation. Insurance is catching-up with only 30% claiming to have the digital capabilities required and 28% the leadership capabilities necessary. "...this is a wake-up call for banks and insurers to re-examine their business models. Tomorrows operating model is collaborative, innovative and agile. The digital masters we looked at are working with an ecosystem of third-party partners, developing and testing ideas more quickly under an MVP model, and nurturing a culture of bottom-up innovation and experimentation. The majority of financial services firms need to learn from the small pool of genuine innovators in their field," says Anirban Bose, chief executive officer of Capgemini's Financial Services and member of the group executive board. 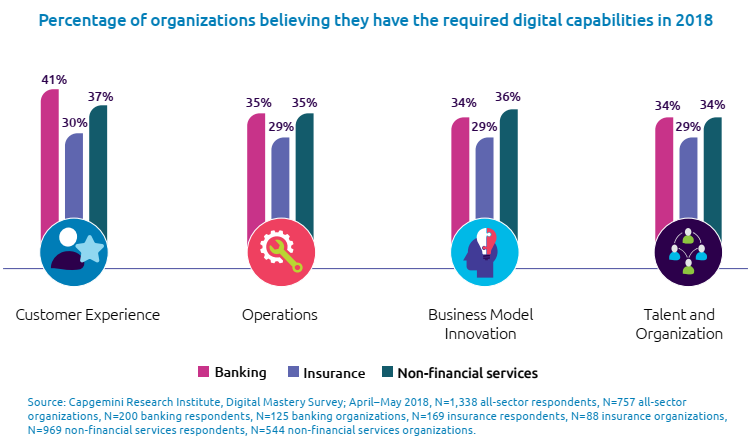 In Capgemini's digital mastery framework presented in the report, just 31% of banks and 27% of insurers are deemed to be digital masters, while 50% and 56%, respectively are classified as beginners. Executives also criticised the lack of a compelling vision for digital transformation across their organizations. "Only 34% of banking and 24% of insurance respondents agreed with the statement that 'our digital transformation vision crosses internal organisational units', with just 40% and 26%, respectively saying that 'there is a high-level roadmap for digital transformation'," the report says. The banking sector does, however, outpace non-financial services sectors on capabilities such as customer experience, workforce enablement and technology and business alignment. 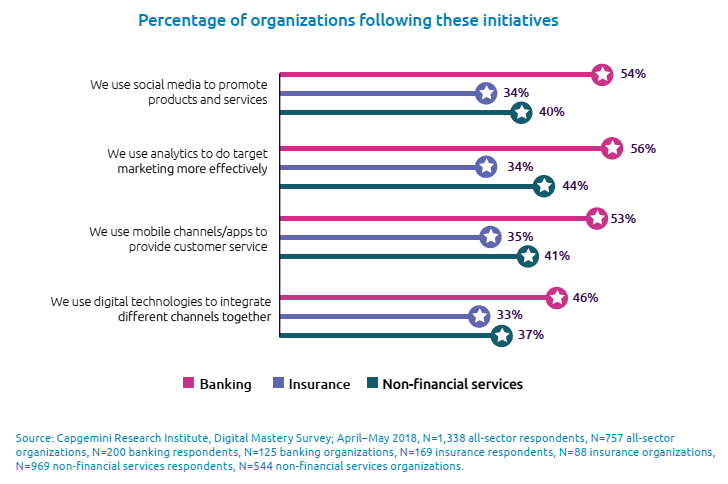 About 56% of the banking firms said they use analytics for more effective target marketing (in comparison to 34% insurance and 44% non-financial services sector). More than half (53%) of banking organisations also said that upskilling and reskilling on digital skills is a top priority for them (32% for insurance and 44% for non-financial services sector). One area of advantage for insurers was operational automation, the report says adding with 42% of executives saying they used robotic process automation, against 41% of bankers, and 34% reporting the use of artificial intelligence in operations, compared with 31% of bank executives. 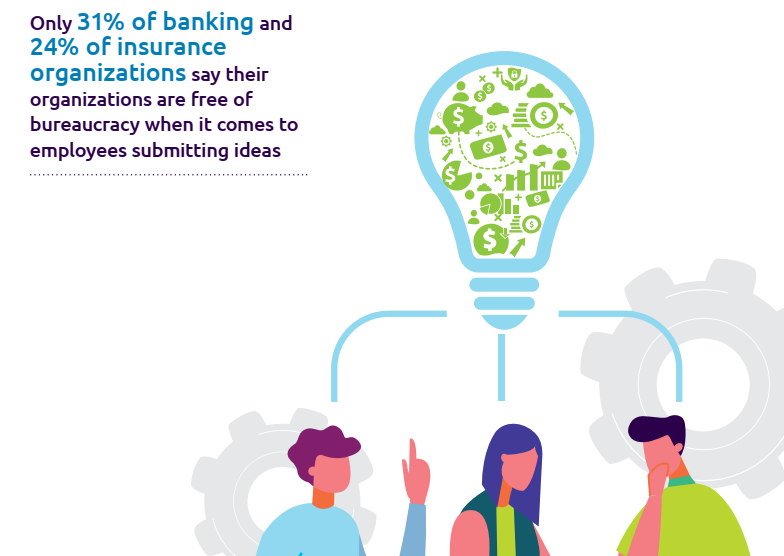 On the other hand, the Capgemini report says business model innovation, defining a clear vision and purpose, and culture and engagement are some areas, which are challenging both for banking and insurance. "Only 33% of insurance and 39% of banking organizations have launched new businesses based on digital technologies and 41% in non-financial services sector. While banking is in line with the non-financial services average, only around a third (34%) of banks had a digital vision that crossed organizational units. Insurance lags even further behind, with just around a quarter (24%) having an all-encompassing vision. In terms of culture aspects as well, only 33% of banking and 25% of insurance organizations thought their leaders were adopting new behaviours required for transformation, as compared with 37% in non-financial services organisations," it added. The Reserve Bank of India (RBI) has levied a penalty of Rs1 crore on ICICI Bank for delay in compliance to RBI's directives on swift related operational controls. The swift system is a messaging network used by banks and other financial institutions globally to send and receive information, such as money transfer instructions. "The RBI, in exercise of powers conferred under Section 46(4)(i) and 47(A)(1)(c) of the Banking Regulation Act, 1949 has levied an aggregate penalty of Rs10 million on the Bank for delay in compliance to RBI's directives on time bound implementation and strengthening of Swift-related controls," ICICI Bank said in a regulatory filing. The Swift system gained spotlight after the Rs14,000-crore fraud at the Punjab National Bank that took place reportedly due to misuse of this messaging software. After the fraud came to light in February 2018, the RBI has been tough on banks for tightening all kinds of transactions. There seems some error in your above report. On the one hand, you say that there was a huge fraud of Rs 14000 crore at PNB by misusing the Swift messaging service and, on the other, you say that ICICI Bank has been fined Rs 1 crore for delaying the use of this service. I use the money transfer service of ICICI Bank and find it the best compared to all other banks. State Bank of India (SBI) and Hitachi Payment Services Pvt Ltd, unit of Japanese Hitachi Ltd have launched a merchant acquiring joint venture (JV), SBI Payment Services Pvt Ltd (SBIPSPL). This JV will establish a state-of-the-art digital payments platform for India and other countries in the region. Hitachi has been providing deployment, technology and management services for the card and digital acceptance payment network of SBI since 2011. The JV, SBI Payment Services will facilitate expansion of the digital payments landscape in India by creating a state-of-the-art digital payments platform that will enable offering of innovative products to suit the requirement of all segment of merchants, leveraging the brand value and unparalleled distribution network of SBI and bringing artificial intelligence and other technological capabilities of Hitachi to the venture, SBI said in a release. SBI, as the largest state-owned commercial bank in India, has more than 425 million customers, around 6,00,000 POS terminals, more than 16 lakh merchant payment acceptance touch points and has migrated more than 80% of its transactions to alternate delivery channels.